Not a whole lot of detail, but a large listing of hauntings naming town, building and nature of haunting. Many of the inclusions here are for haunted college buildings, inns and more. A story on ghost-hunter Stephen Marshall, dealing in particular with the haunted railroad bridge in Hartford. Also check out Joseph Citro's Green Mountain Ghosts, Ghouls & Unsolved Mysteries. AllStays provides info on the White House Inn of Wilmington, haunted by the spirit of Mrs. Martin Brown. The Inn itself makes the most of it by scheduling a ghost hunt and seance on Halloween weekend. X-Project looks into the various ghosts attending the University of Vermont. A brief description of the Shard Villa Mansion, a haunted inn in West Salisbury. Haunted? Hmm, perhaps. Cool? Definitely! Located in Bennington. 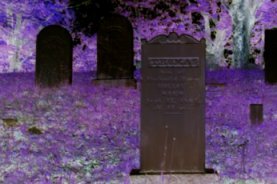 Looking for more ghost/haunts information? Check out our sister site, Scarefair.com.